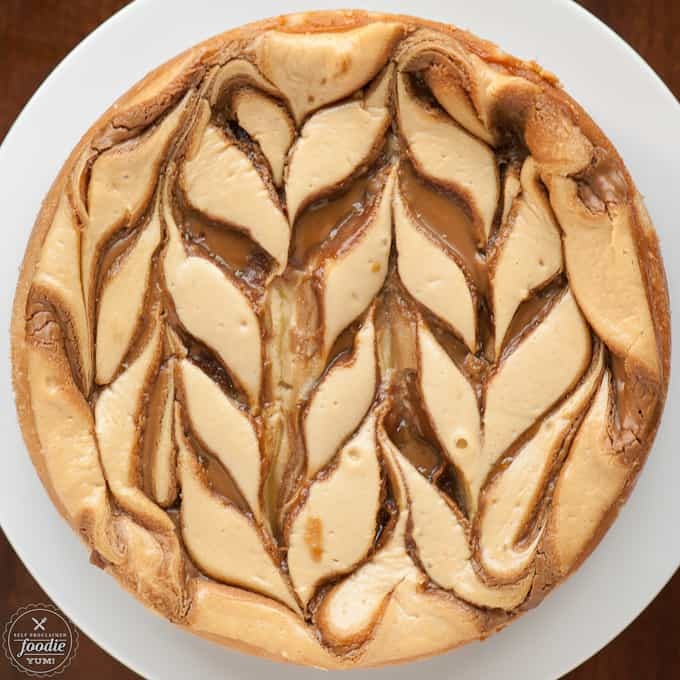 This Cookie Butter Cheesecake transforms a classic cheesecake into the most delicious dessert with a speculoos cookie crust and cookie butter swirl. I kind of nailed this one out of the park. I’m not too modest to admit that. I nailed it. 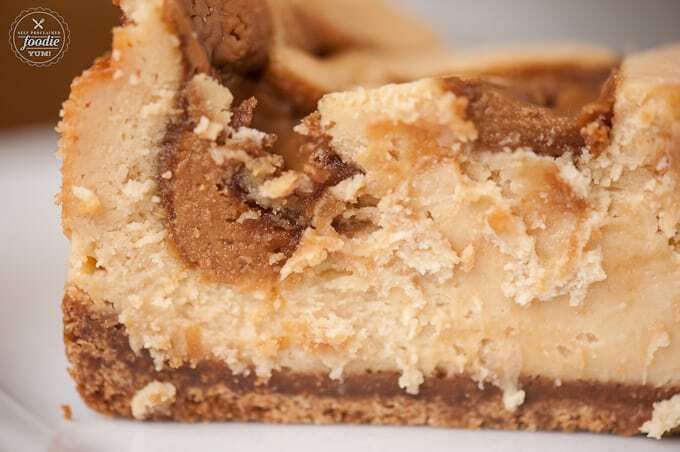 For me to explain how incredibly delicious this recipe is, you must have a solid understanding of what cookie butter is. If you know it, I’m sure you already love it and that makes me happy. If you’ve never heard of it, I’m willing to forgive you because I assume a) you can’t shop at Trader Joe’s because there’s not one within 50 miles of you or b) well, that pretty much covers it. 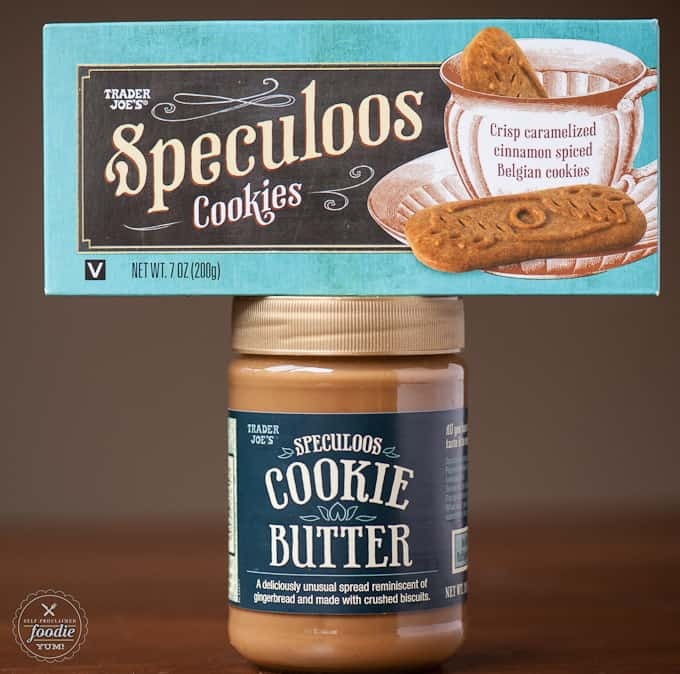 Cookie butter, I’m pretty sure, is something the folks in the US are obsessed with, but they’re all about a European cookie. Here’s a bit more information I found using my super smart friend, Google, in case you wanted to learn more about cookie butter. So, this recipe was a bit of an experiment. 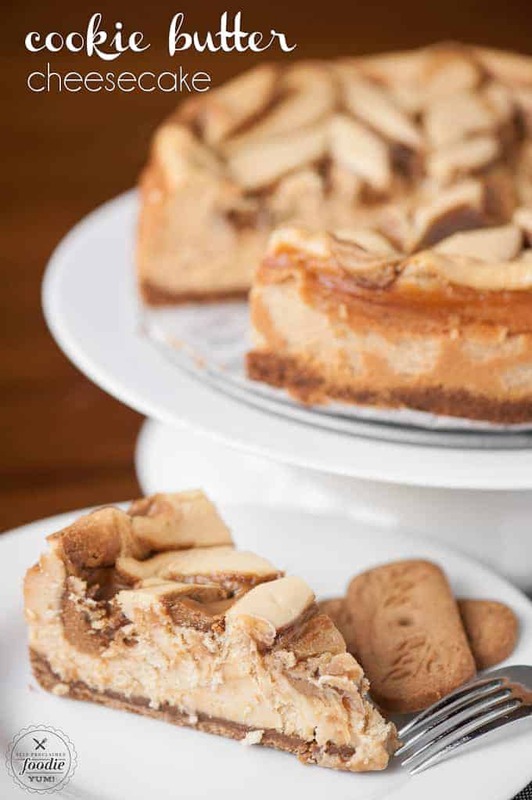 I started with my standard classic never fail cheesecake base which I use in every cheesecake recipe like this apple compote cheesecake, but I did a few things differently in order to crown it with the title of Cookie Butter Cheesecake. First off, instead of your traditional graham cracker + sugar + butter crust, I made the crust out of speculoos cookies and butter. I could have happily stopped right there and shoved my entire face in that bowl only to regret it when my jeans no longer fit the next week, but I held back. Then I made my traditional base but I folded some of the cookie butter into the mixture. It has the consistency of peanut butter so it mixed well. Then, I warmed some more up so it was pourable, spreadable, and swirlable and made that gorgeous design on top. Lovely, don’t you think? 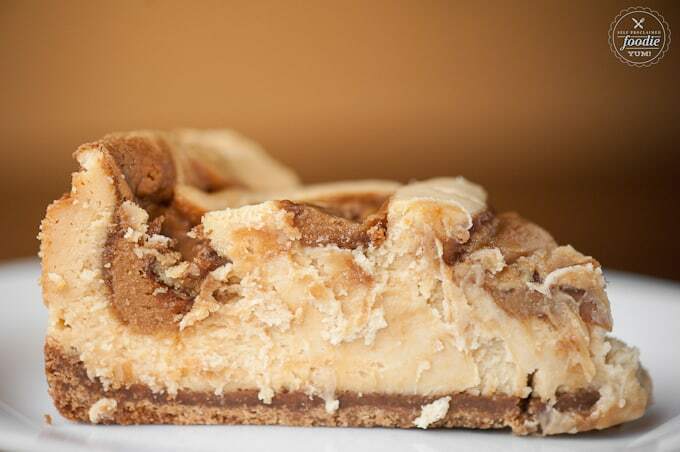 The result: an insanely perfect mouthwatering cheesecake. I brought it into work and everyone freaking loved it. There was enough for my husband to take over to his area (we work for the same company) and they inhaled it. In fact, one of his co-workers offered to pay me to make him an entire cheesecake. I thought about serving it with additional melted cookie butter drizzled over the top with some crushed cookies, but honestly it didn’t need it. The cheesecake was perfect as is. Like I said – I nailed it. 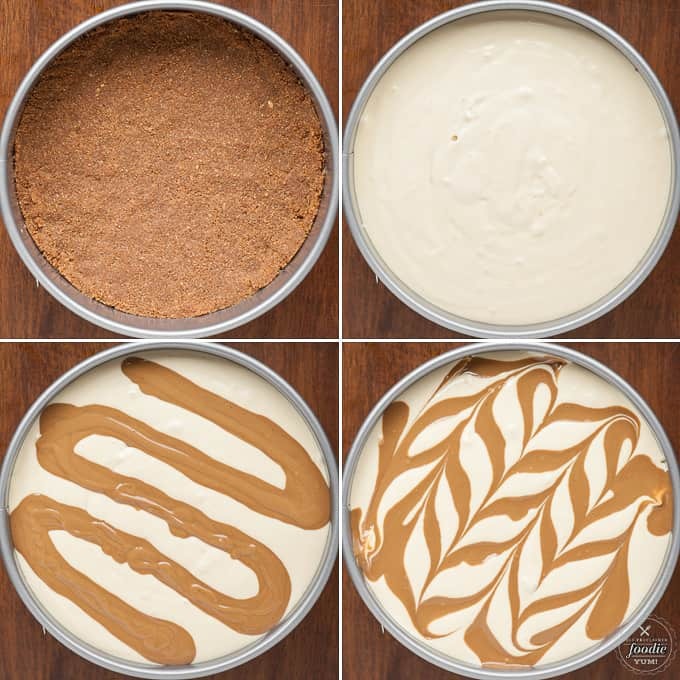 I hope you’re able to get your hands on some cookie butter so you can make it too! Line the bottom of a 9" springform pan with parchment paper and secure the bottom. Turn your cookies into fine crumbs in the food processor or by smashing in plastic freezer bag. Combine crumbs with melted butter in medium sized bowl and then flatten on the bottom and up the sides of the springform pan. Set aside. Add the sugars and 1/4 cup of the cookie butter to the cream cheese. Cream mixture until well combined. Scrape again. Add whole eggs one at a time. Mix until combined. Scrape again. Pour cheesecake batter onto crust in springform pan. Allow at least 1/2" of room at the top for the cheesecake to expand while cooking, so you may end up with a bit of excess batter. Heat 3/4 cup cookie butter just until melted, about 40 seconds in the microwave. Pour onto filling and use a knife to swirl. You may want to line the bottom rack with foil just in case any butter from the crust seeps out while baking to keep your oven clean. Bake at 350 degrees F for 10 minutes. Reduce heat to 275 degrees F and bake and additional 70-80 minutes until center jiggles but edges are set. Turn oven heat off, crack oven door, and allow cheesecake to finish cooking in turned off oven. How big of a pan did you use? Looks amazing! Deena, I also updated the recipe to include that I used a 9″ springform pan. Wondering if you used an 8″? Hi! Do you think this can be made successfully in a 10 inch springform? I’m thinking this looks perfect for my birthday gathering! yep! Just stop cooking it when its just about set. I was wondering do you bake the crust at all before putting the filling in the pan? 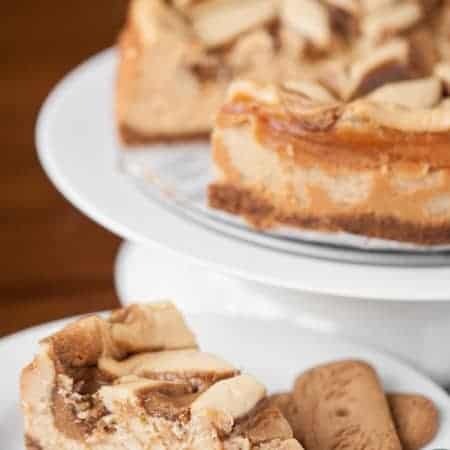 Mine and my husband’s heritage is from Friesland and I had this idea to incorporate Speculaas into a cheesecake but I wasn’t sure how much to use… then I found your recipe and I’m thrilled… I plan on making it for Thanksgiving along with a pumpkin cheesecake (any suggestions for the pumpkin cheesecake?). Hi Sheery! I don’t parbake the crust for this one. In fact, I have to show major restraint not to just eat it before adding the filling! I just so happen to have a pumpkin cheesecake recipe: https://selfproclaimedfoodie.com/perfect-pumpkin-pie-cheesecake/ I cut into it for the photos when it wasn’t completely chilled (but it was perfectly baked). If you make that recipe, just make sure you allow enough time (ie over night is best) to let it chill and set before cutting). Happy Thanksgiving! What purpose does 1) the cornstarch serve (I’ve never had to add that to any other cheesecake recipe) and 2) open oven door (I was taught to not open oven until completely cooked to avoid cracking). The consistency is a bit odd (not super dense like I prefer) but it was a hit at my office thanksgiving lunch today. Hi Sylvia, I used this base recipe with the cornstarch and the oven opening from a friend who owns a bakery and competed on the Food Network. Funny thing is I thought those two steps were weird, too, but never questioned them because her desserts always turned out so amazing. Yes – this recipe is definitely not as dense as a traditional NY cheesecake, but I’m glad everyone enjoyed it! I love this recipe, this is my third year in a row making it for Christmas. It’s always a hit wherever I take it. Thank you!